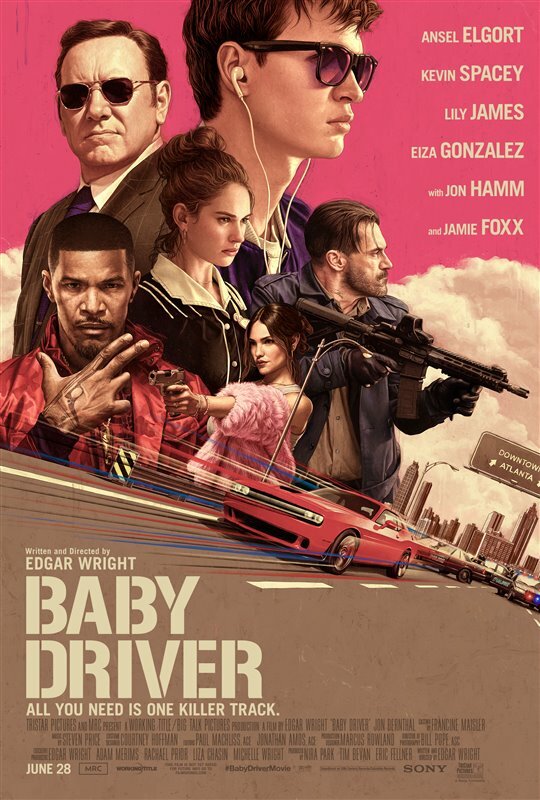 Edgar Wright’s Baby Driver is like the cinematic equivalent of a guitar solo, an example of a singular filmmaker showing complete control over his craft, while riffing on a wide variety of genres and proving the full extent of what he is capable of. It’s thrilling to watch a maestro like this at work. We already know that Edgar Wright is a master at delivering genre-defying cult classics, with the unofficial trilogy of Shaun of the Dead, Hot Fuzz and The World’s End as well as the honorary Canadian film Scott Pilgrim vs. The World. With Baby Driver, the director has delivered something akin to a car chase musical, an action movie that cuts its set-pieces in time to songs, offering the most entertaining ride of the year so far. The film follows Baby (Ansel Elgort), a young getaway driver who uses music to drown out the tinnitus he’s been left with since being in a tragic accident as a kid, and times his jobs in accordance to specific songs. Working to pay off a debt to crime boss Doc (Kevin Spacey), Baby starts wanting out of his life of crime when he falls in love with young waitress Debora (Lily James). But he gets pulled in for one last job where things threaten to go dangerously awry, as the hardened crew including Buddy (Jon Hamm), his girlfriend Darling (Eiza González), and the wildcard Bats (Jamie Foxx), become increasingly suspicious of whether or not they can trust Baby to help pull off a violent robbery. The idea of setting heists and car chases to music is one that Edgar Wright first conceived in his youth, and used it as the basis of his 2002 music video for the band Mint Royale, which also serves as a basic blueprint for the opening scene of Baby Driver, set to the track “Bellbottoms” by The Jon Spencer Blues Explosion. The filmmaker stages sequence after sequence of thrilling action, with every single car chase and shootout clicking in tune to the soundtrack. Baby has numerous classic iPods that hold different playlists, and the film brilliantly utilizes about thirty tracks culled from multiple decades of music. Like the Guardians of the Galaxy films, Baby Driver is filled with classic songs that are masterfully woven into its story, providing an awesome backdrop to the action in a way that makes the whole thing feel alive. The film uses a couple of different versions of “Easy” to surprisingly moving effect, both to score a heartbreaking flashback partway through, and also over the poignant final scenes. A warehouse gunfight set to “Tequila” provides a particularly fun musical cue, and Baby Driver also of course works in the Simon & Garfunkel tune that gives the film its title. Ansel Elgort carries the film with a swagger and confidence that is incredibly appealing to watch, whether dancing down the street and through his apartment or cooly manipulating the steering wheel during a tense car chase. But the young actor also brings a quiet, emotional vulnerability to the role that allows us to really connect to his character. Some of the most touching scenes in the film are between Baby and his elderly stepfather Joseph (CJ Jones), a man who is deaf and uses a wheelchair. Baby is almost always wearing earphones and often reads lips, and Joseph can’t hear, but the two of them are able to communicate fluently through sign language and movement. The film has an excellent supporting cast. Kevin Spacey masterfully delivers the fast paced and razor-sharp dialogue, Jon Hamm does brilliantly intense work with glimmers of humanity underneath, and Jamie Foxx provides an increasingly menacing antagonistic presence. The fact that the impressively choreographed car chases were created using practical effects gives them a classic and tactical feel that furthers the excitement, and Bill Pope’s cinematography offers a memorable mix between pop art style and noirish visuals. Finally, the editing by Jonathan Amos and Paul Machliss brilliantly ties the whole thing together, cutting in time to the music and keeping the film moving at an exhilarating pace. The film deftly blends genres, using the narrative structure of a crime thriller to work in elements of comedy, romance, character drama and music video style, all the while paying loving tribute to a variety of other cinematic classics. There’s even a pretty great reference to Monsters, Inc. worked in, which I certainly appreciated. The film itself could be vaguely described as playing like a cross between Drive and The Blues Brothers, but it always manages to feel fresh and entirely likes its own thing, feeling both like a genre homage and like something we’ve never seen before. There has been a lot of hype surrounding Baby Driver, and the film more than lives up to it on every level, feeling like an instant classic right from the opening scenes and never letting up from there. This is an example of pure cinematic exhilaration, a work that embraces its own style without ever sacrificing character or story, allowing all of its elements to play together in perfect harmony. It’s a slickly edited, wildly entertaining and surprisingly moving car chase thriller, all set to a great soundtrack. Try your best to see this one on a big screen with loud sound to get the full effect. In Edgar Wright’s newest film Baby Driver, Ansel Elgort plays the title character Baby who is a getaway driver paying off a debt to crime ring leader Doc (Kevin Spacey) by providing his car-handling skills. Baby is a ‘devil behind the wheel,’ driving like a master stunt driver and getting away from cops and helicopters with an almost calm ease. Despite being good at it though, all he really wants is to be done with this world of crime. But when one of the jobs goes bad due to team member Bats (Jamie Foxx) disobeying orders, things start to go downhill, and it begins to seem like maybe Baby won’t be able to get out of this line of work after all. As the film goes on and we watch someone forced into this world, but not really wanting to be a part of it, we are taken on a ride of an observer in a violent world, who is all the while scoring his entire experience through music. The quiet Baby is a very relatable character, played with subtle nuance by Elgort, who has proved time and time again to be an actor that can show so much emotion while being very still (and even quiet), allowing his eyes to do the talking for him. Baby Driver is an utter masterpiece, and the use of diegetic sound to present the soundtrack is brilliantly realized here. As the main character Baby listens to his collection of iPods, we hear what he hears, whether that means muffled dialogue or just a song taking over all the other sounds in the background. It is done so well that it feels natural and really adds to the experience. Also, refreshingly for an action film, so much of it is centred around Baby’s interpersonal interactions – be it with the young waitress (Lily James) he starts to fall in love with at the diner, or with his Deaf step-father (CJ Jones) who he communicates with through sign language. The storyline with his step-father especially is incredibly touching and really helps round out who Baby’s character is when he is not behind the wheel. In fact, the entire script is super-tightly written and I am sure there will be lines and callbacks that will become apparent on subsequent viewings. This Summer there have been a few films that really stand out, and Baby Driver is definitively one of them. While it will be fun on a small screen as well, I highly recommend seeing it in a theatre with a large screen and speakers to get the full experience of the action and soundtrack. Funny, intense, entertaining, and moving, this is sure to become another well-deserved classic of Edgar Wright’s. Baby Driver is the latest film from Edgar Wright. 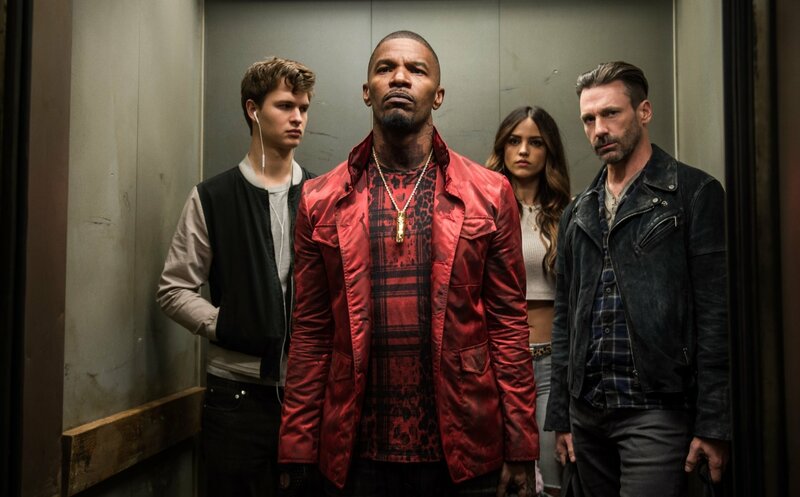 The title character (Ansel Elgort) is a brilliant car thief and getaway driver indentured to Doc (Kevin Spacy), an evil crime boss who assembles robbery gangs from a pool of really scary characters (Jon Bernthal, Jamie Foxx, Eiza González, Jon Hamm). As a child, Baby had survived a car crash that killed his parents and left him with tinnitus, so he must always wear earbuds with tunes that provide the soundtrack not only for his life but for the film itself. Living with his foster parent, an elderly deaf man (CJ Jones) and finding a new girlfriend Debora (Lily James), a waitress at the local diner, Baby has saved his share of the loot and is being assured that the next job will be his last. Baby Driver is brilliant in every way. As a straight heist film it has a really gripping story with great writing served by a gifted cast with sudden death at every turn but also flashes of real wit. The action scenes using almost no CGI are epic, particularly the chases through Atlanta streets with mainly ordinary cars actually driven from the roof (like Mr. Bean at New Year’s) by the best stunt drivers in the business led by Jeremy Fry. What really makes the film special is the soundtrack. All the music was cleared before filming, including the 50 year old Simon & Garfunkel song over the closing credits that gave the film its name. With the tunes in the ears of each performer and crew member, every move (Elgort is a trained dancer), gunshot, even windshield wiper cycle is synchronized to music perfectly chosen for each scene. With all these things going for it, not to mention loads of extra touches that the director likes to throw in that may escape us at first, I am confident that Baby Driver is already among the best films ever made in any genre, and will delight audiences even more in subsequent viewings.